This section introduces the growth and development of modern philanthropy in Mainland China. In modern times, the development of China’s philanthropic sector has been foreshadowed by remarkable growth in the country’s wealth. With a population of nearly 1.4 billion people, China is the largest country in the world. It had a GDP of nearly USD 11 trillion (RMB 67 trillion) in 2015, making it the second largest economy in the world after the United States. According to the World Bank, China’s GDP grew over 800% between 2000 and 2015. China is now home to more billionaires than the United States. There are 609 billionaires in China, compared with 552 in the United States according to the latest Forbes World’s Billionaires 2017.3 Growing with the country’s wealth is the number of foundations. 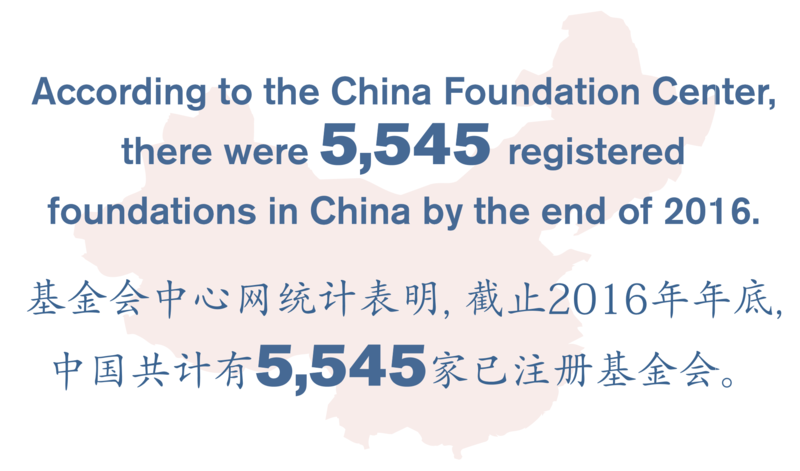 According to the China Foundation Center, there were 5,545 registered foundations in China by the end of 2016. Over the past 30 years, China has lifted more than 500 million people out of poverty. 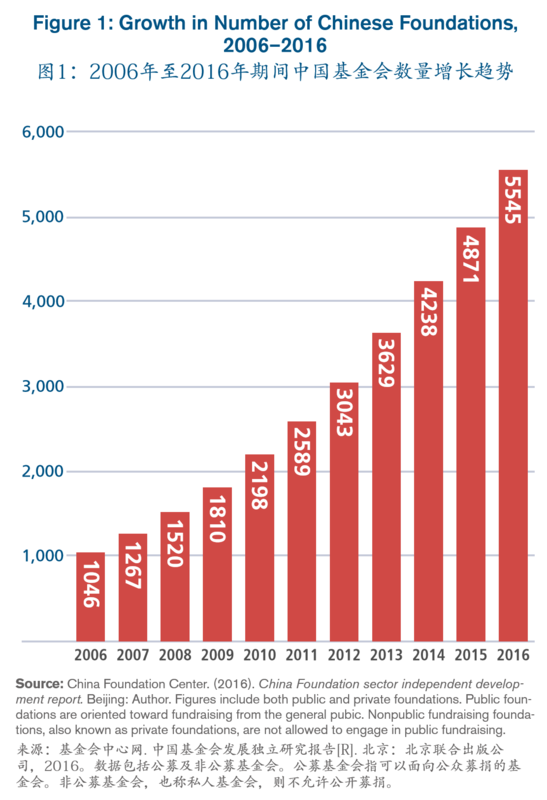 The philanthropic sector in China is growing. 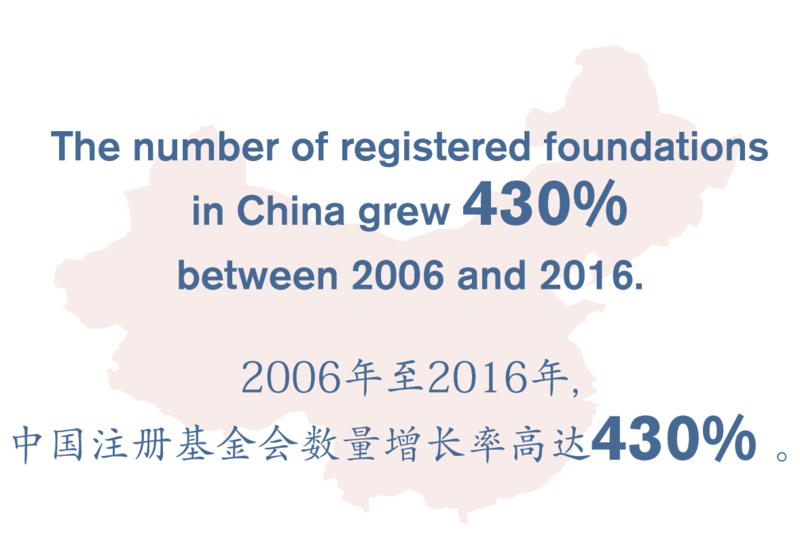 According to the China Foundation Center, the number of foundations in China grew 430% between 2006 and 2016 (Figure 1). This growth is being driven by private foundations. * While the number of public foundations grew 123% between 2006 and 2016, the number of private foundations grew 1,057% over the same period. 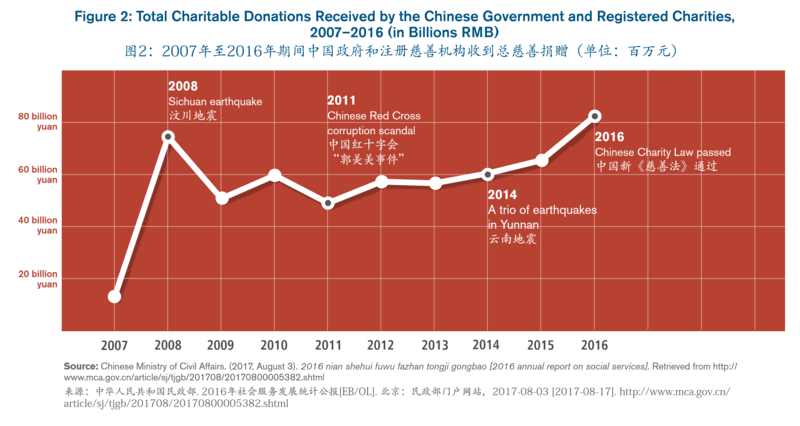 In 2016, the total giving surged again possibly due to increased confidence in the philanthropic sector with the passing of the new Charity Law by China's National People's Congress. In 2014, the Lao Niu Foundation dispersed the most donations of any private foundation, distributing more than USD 30 million (RMB 186 million) (Table 1). Among its current projects is the planting of 40 million trees in Inner Mongolia, where the foundation is based. According to a 2014 article in the Wall Street Journal (Figure 3), the top country/region donor to U.S. colleges from January 2007 to November 2013 was Hong Kong, with USD 181 million (RMB 1.1 billion) in total donations. Most philanthropic donations in China are directed toward education. 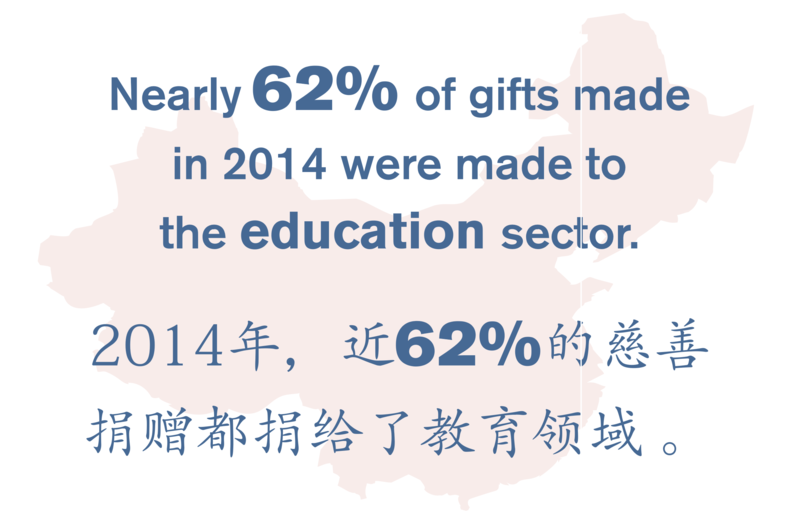 According to the China Foundation Center, nearly 62% of gifts made in 2014 were made to the education sector. In the Hurun Research Institute’s 2016 analysis of China’s top 100 philanthropists, 46% of their donations were made to education. Table 2 lists 10 examples of giving to higher education in both the United States and Greater China by GCPI Chinese philanthropists. In early 2016, China’s National People’s Congress passed the Charity Law, a set of sweeping regulatory changes to how the nation's philanthropic sector operates. Prior to the law’s implementation, China’s tax policies limited philanthropic activity by (1) requiring initial foundation endowments be in cash, (2) taxing the income earned from foundation investments at the same rate as for-profit enterprises, and (3) failing to provide tax exemptions for establishing a foundation upon one’s death. Among its most notable provisions, the law smooths the way for nonprofit groups to legally register and raise funds, encourages giving by improving tax incentives, and makes it easier to establish charitable trusts. The new law provides a tax credit for businesses that provide charitable donations, waiving corporate income tax on donations accounting for up to 12% of profits. The new law allows any charities to register directly with the Ministry of Civil Affairs; previously charities had to seek other bureaucratic agencies to serve as sponsors, resulting in complicated and lengthy procedures. For fundraising charities, registration is allowed for those that have been in operation for at least two years. Also, the new law no longer restricts the number of organizations registered in one administrative area, whereby promoting nongovernmental organization (NGO) development. For donors, tax provisions have been further clarified, and noncash assets may be used to create foundations. The law also creates greater accountability and requires charities to publish articles of association, organizational information, and annual reports with financial statements. Many anticipate the law will stimulate further growth in an already-booming philanthropic sector.